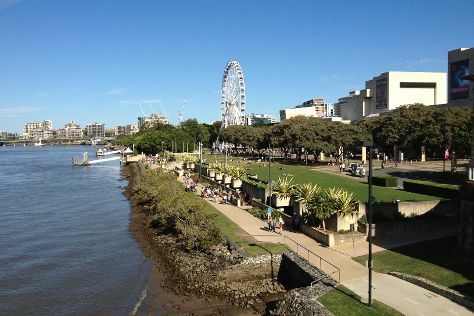 On the 27th (Thu), stroll around Roma Street Parkland and then stroll around South Bank Parklands. To find reviews, maps, more things to do, and more tourist information, read our Brisbane trip planner. Singapore, Singapore to Brisbane is an approximately 11-hour flight. You can also do a combination of flight and bus; or do a combination of bus and flight. You'll lose 2 hours traveling from Singapore to Brisbane due to the time zone difference. Expect cooler temperatures when traveling from Singapore in June; daily highs in Brisbane reach 24°C and lows reach 13°C. Cap off your sightseeing on the 27th (Thu) early enough to travel to Port Douglas. Start off your visit on the 28th (Fri): see some colorful creatures with a scuba or snorkeling tour. On your second day here, get to know the resident critters at Wildlife Habitat Port Douglas, then identify plant and animal life at Hartley's Crocodile Adventures, and then don't miss a visit to St Mary’s by The Sea chapel. To find more things to do, photos, other places to visit, and more tourist information, you can read our Port Douglas road trip planner. Do a combination of flight and shuttle from Brisbane to Port Douglas in 6 hours. Alternatively, you can do a combination of bus, flight, and shuttle; or drive. In June, Port Douglas is somewhat warmer than Brisbane - with highs of 30°C and lows of 21°C. Cap off your sightseeing on the 29th (Sat) early enough to go by car to Cairns. On the 30th (Sun), discover the deep blue sea with a scuba or snorkeling tour. To find photos, more things to do, maps, and other tourist information, you can read our Cairns online trip itinerary builder . Drive from Port Douglas to Cairns in 1.5 hours. Alternatively, you can take a bus; or take a shuttle. June in Cairns sees daily highs of 30°C and lows of 22°C at night. Wrap up your sightseeing on the 30th (Sun) to allow time to travel back home.